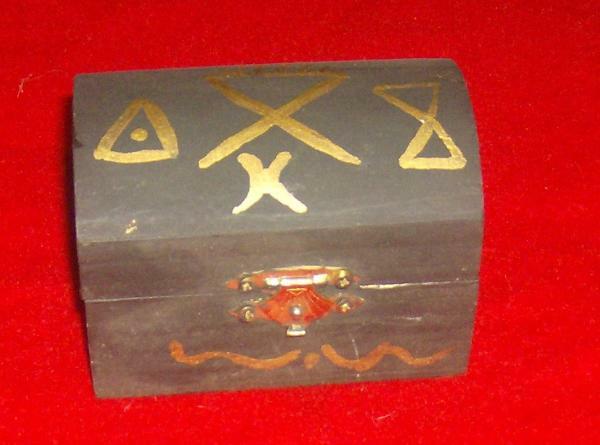 The picture above is a Conjure box spell I did about fifteen years ago. I have kept this box all these years as a reminder to myself. To remind myself of what I can and will do in defense of my family and also why I made this box and the results. This is not the type of work you just do on a whim, for a client or because someone has made you mad. Drastic actions cause drastic measures. I'm not proud of this work, but I would do it again if someone I love life was threatened. The symbols on the box don't mean anything to anybody but me; for me they hold power. To do this work you need, graveyard dirt, roots, herbs, candles, a box, dollie, personal concerns, and your ancestors. This is one work I will never forget or what I was feeling at the time the box was put together. I have three brothers, my oldest brother passed away a few years ago. This work concerns one of my baby brothers. My favorite brother. I'm six years older than him, and we have always had a special bond. I'm fourteen years older than my other brother who we will call J.W. he's the baby of the family. Since my Mama passed; I'm the one everyone comes to when there is a problem in the family. The younger ones tend to try and hide things from me until they can't phone call turned the world upside down.J.W. Called and said " hey sis have you heard from our brother"? I knew right then something was going on. I said no; why? He tells me that this old man is out looking for our brother with a gun, all over town. We all know this old man; we grew up around these people. I don't have a doubt in my mind that he would have killed my brother if he would have found him. This old guy is meaner than a snake. By the time I hung up with JW I was so furious until I couldn't even think. I wanted to hear what my brother had to say about this so I called him. that the old man was looking for him; he ask to go on a job. He wanted to give things time to cool off. He told me he wasn't going to get into it with no old man in a wheel chair. When my brother got back into town he was told the old man was looking for him with a gun. Needless to say I went berserk. I scared my own self. I told my brother to stay away from that old man. He told me he was leaving in two days to go back out to work and would be gone two weeks. That night I went to work, I stayed up all night just fuming. I made a dollie out of wax, I bound his head and his hands. Then I nailed him down with coffin nails and added other things to the box. I worked that box all night. The next morning I headed for the grave yard. I meant to kill that old man. I really don't remember the two hour drive to the graveyard or what I said when I got there. I remember falling to my knees at my mama's grave and holding that box up over my head and screaming at the top of my lungs calling for the old mans death. I'm not sure how long I was there. I had one thing on my mind "stopping that old man from hurting my brother". just feel apart. I felt like a balloon that the air had been let out of. Mama told me not to worry about it; that she would take care of it. She told me to go home; so me and the box went home. My brother came in from his job and he decided that he wasn't going to run and hide from the old man any more. My brother and sister-in-law went out, they weren't in the club thirty minutes until the old man came rolling in. He rolled over to where my brother was sitting and ask my brother if he could buy him a drink; and that he wanted to speak to my brother alone. Before my brother could say anything the old man told him he was sorry for the misunderstanding. It seems that people who wouldn't speak up for my brother and tell what happened started telling the old man what really happened that night. When the old man got hot on his sons they admitted that my brother was just defending himself against the both of them. He shook my brothers hand and told him if they ever jumped him again that he wasn't going to lift a finger against my bother. So my mama did take care of the situation. I still have the box with the old man in it and I refuse to let him out. I thank God my Mama stopped me; but I would do it again if it came to someone I love. Box spells are good for containing a person who could harm others. A simple box spell is to place a dollie named for the person placed in a box with small mirrors glued in the box. This reflects their actions back at them. No matter which way they turn they run into themselves.